Victoria County is a county located in the state of Texas. Based on the 2010 census, its population was 86,793. Its county seat is Victoria. Victoria County is included in the Victoria, TX Metropolitan Statistical Area. 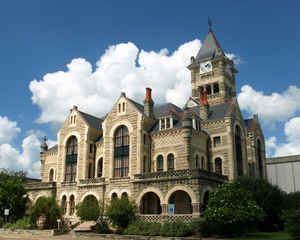 Victoria County is a county located in the US state of Texas. Its county seat is Victoria. Victoria County was formed in 1836. It was named after Guadalupe Victoria, the first President of Mexico. Craig H. Roell, "VICTORIA COUNTY," Handbook of Texas Online (http://www.tshaonline.org/handbook/online/articles/hcv03), accessed January 24, 2016. Uploaded on June 15, 2010. Published by the Texas State Historical Association. As reported by the Census Bureau, the county has a total area of 889 square miles (2,302 km2), of which, 882 square miles (2,286 km2) of it is land and 7 square miles (16 km2) of it (0.70%) is water.